I enjoyed doing the recent PPK cookbook challenges so much that I decided to continue them on my own. I’ve got a lot of cookbooks that I like to look at but don’t often cook from, and now that we’re lucky enough to be in an age where there are far more vegan options to buy, books now need to earn their place on my overloaded shelves. I’m going to choose books or a cluster of books and aim to cook around 5 recipes over a 2 week period and see how that goes. I started by picking out 2 books that were both gifts but that I’ve never used – Fresh and Refresh. They are from a small restaurant/café chain in Toronto which is a place I’ve never visited, but I think my husband stumbled across the books on a trip to Vancouver. There are 4 books, but the first book is just about juices, is out of print and is now incorporated into ReFresh, the third book. Fresh is the most recent book. Neither of the books I have are vegan but ReFresh is more so; it uses a little honey but that’s it. 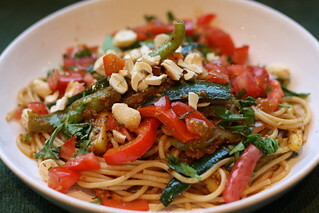 Fresh has a few recipes that use cheese but vegan alternatives are generally given and it’s otherwise vegan. The books definitely live up to their titles. There are lots of recipes for salads, soups, sandwiches and snacks, and most of the main courses are bowl type dishes that use a couple of recipes from elsewhere in the book. There are pastas and breakfast dishes but they’re generally quite light. I think the hot spell we’ve been having is what drew me to try out these books right now. The first recipe I tried was the Dragon Rice Bowl from Refresh. 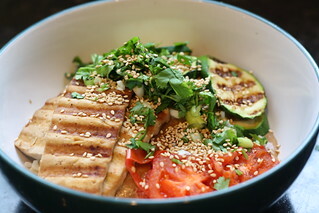 It uses a grilled tofu and a miso sauce from other chapters and then throws them together with rice, grilled vegetables and sesame seed and coriander garnishes. I liked this very much; the sauce was fantastic and the coriander flavour in the tofu was unexpectedly good. Maybe it’s a Canadian thing but the recipe asks you to grill the tofu and veg in the oven, which is more English than American, but the picture in the book distinctly shows grill marks, so I used my electric griddle. Either way it was very tasty. Next up, from Fresh, the Lemon Noodles with Greens. This looked like a light tasty dish to try when I got in late from work one night, and it didn’t disappoint. Much more liquid than I would normally expect from a pasta dish, it almost verged on being soupy. Very light tasting, quick to cook and perfect for a sunny evening. It made more servings for us than it claimed, which is a rare thing indeed. 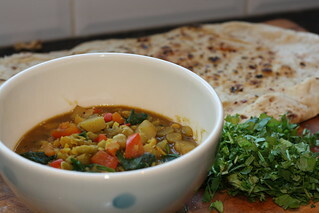 Next on my list was the Nepalese Dahl from ReFresh. It uses 2 different type of split peas, and I don’t know where cookbook authors find their magic split peas that cook faster than the speed of light, but I soaked them overnight and they still took about 5 times longer than the recipe suggested. It’s not the only cookbook I own where that happens though. The recipe called for green peas but thinking about the pea hater in the house I left them out and used half a bag of wilting spinach instead. This was perfectly pleasant, more of a stew than a real dahl, nicely spiced but probably not something I’d make again compared to all the other dhal recipes I love. I had a disaster with the tofu omelette from the breakfast chapter of ReFresh. I’m not great with tofu omelettes but this was my worst effort yet, it was so wet I certainly couldn’t pat it down into shape so I tried to just fry it regardless and it didn’t work at all. I cooked just a bit and didn’t even enjoy the flavour; it was far too oniony, so I’m writing that one off unless anyone has had it work out for them. The next recipe was a bit of a mixture of two dishes to use up what I had in. I made a version of the Laksa Rice from Fresh but used the coconut curry sauce from ReFresh instead of the laksa broth. 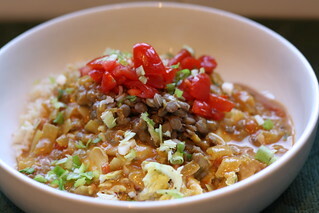 It has brown rice, lentils, loads of Chinese cabbage and coconut curry sauce. Another easy midweek dish and I’ll definitely use the sauce again. 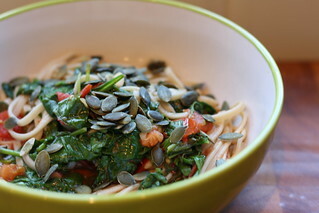 The Sri Lankan Spaghetti from Fresh was very quick and easy too. It called for 8 cups of cooked spaghetti which irritated me immensely – who has leftover spaghetti around and even if you do, who measures it in cups? I cooked 8oz of wholewheat spaghetti and was able to make the rest of the dish while it cooked. I did use a different Sri Lankan spice blend that I’d already made for something else, but it contained similar ingredients. For me there too much lemon and soy sauce in this and I reduced it as I was making it. I’d also add the spices a bit earlier in the cooking so they had time to toast, but this was a delicious and very quick meal, full of vegetables. I can see me making this many times. I added some toasted cashews for a bit of crunch and to hark back to the cashew curries I enjoyed in Sri Lanka, but chickpeas would also bulk it out nicely if you wanted. The final dish I made was the Cuban Potato and Chickpea soup from ReFresh, which I didn’t manage to get a decent photo of. I added a bit more paprika and cayenne than the recipe called for but actually it would have been fine without it. Spices, vegetables and a pulse in a yummy broth; there wasn’t much to go wrong here. I’m so glad I picked these books to cook from for a few weeks. They’re a perfect choice if you’re looking for something a bit lighter, but they’re definitely not afraid of using oil or carbs, which suits me down to the ground. If you’re avoiding gluten I think you’d do well too; there’s not much of it. I made more from ReFresh than Fresh but I like them both equally. They have nice glossy paper and plenty of photos. I’m not over thrilled by the second half of ReFresh which is all about juicing and elixirs, but I just look at it as getting a bonus free book I won’t use, because there’s enough in the other sections to enjoy. Possibly the best sections are the sauces and dressings, and they can easily be mixed and matched with other parts of the book, so if you like bowl style eating these are very good books for you. I loved planning these dishes and I have more to try, so these 2 will certainly be keeping their place on my shelves.